i. The Government of India has announced that 1st of July shall be commemorated as ‘GST Day’. 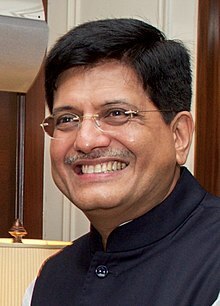 Union Minister for Railways, Coal, Finance & Corporate Affairs Mr Piyush Goyal presided over as the Chief Guest of the event and Minister of State for Finance. ii. The government of India is celebrating the 1st Anniversary of the Goods and Services Tax (GST) coming into force on 1st July 2017.
iii. Four Laws namely CGST Act, UTGST Act, IGST Act and GST (Compensation to States) Act were passed by the Parliament and since been notified on 12th April 2017. All the other States (except Jammu & Kashmir) and Union territories with legislature have passed their respective SGST Acts. i. The Maharashtra government announced a new scheme called 'Kanya Van Samruddhi Yojana', wherein farmers families where girl children are born will be given saplings for plantation. ii. The scheme is aimed at empowering women and promoting tree plantation. The scheme was approved in the cabinet meeting chaired by Chief Minister Devendra Fadnavis. · Maharashtra CM- Devendra Fadnavis, Governor- C Vidyasagar Rao. i. The ninth and final meeting of Eminent Persons Group (EPG) on Nepal-India Relations concluded in Kathmandu, Nepal. The Representatives from Nepal and India deliberated upon various bilateral issues including 1950 Peace and Friendship treaty, trade, transit and border during the two-day meeting. ii. The EPG is a joint mechanism consisting of experts and intellectuals from India and Nepal. It was set up in February 2016 to make suggestions for updating all existing bilateral treaties and agreements between both the countries. · Khadga Prasad Sharma Oli is the current Prime Minister of Nepal. · Bidhya Devi Bhandari is the current President of Nepal and commander in chief of Nepalese Army. · The Nepalese Rupee is the currency of Nepal. · Kathmandu is Capital of Nepal. i. Asia's first arbitration centre specialised in intellectual property is slated to open in Tokyo in September 2018 to resolve the growing number of disputes in the region. ii. The International Arbitration Centre in Tokyo (IACT) is set to have around a dozen arbitrators from around the world, who would try to resolve disputes within a period of one year. · Japan Capital- Tokyo, Currency- Japanese yen, Prime Minister- Shinzo Abe. i. With the persistent decline in poverty, India is no longer a nation having the largest number of poor people in the world, according to a study published by the US-based think tank, Brookings. ii. According to the study, Nigeria has already overtaken India as the country with the largest number of extreme poor in early 2018, and the Democratic Republic of the Congo could soon take over the number 2 spot. iii. The study, titled 'The start of a new poverty narrative' and published in the Brookings' blog, is authored by Homi Kharas, Kristofer Hamel and Martin Hofer. i. capital of the United Arab Emirates (UAE), has topped the list of "smart cities" in the Middle East and Africa, according to the Abu Dhabi's Department of Culture and Tourism. Covering 50 international cities, a report by McKinsey Global Institute titled "Smart Cities: Digital Solutions for a More Livable Future" views how cities all over the world use technology to improve the quality of life. ii. With a rating of 18.4, Abu Dhabi ranked the first in the region ahead of Dubai, which was placed the second with a rating of 17.3.
i. The Tata Steel board gave the green flag to the joint venture with German steel giant Thyssenkrup. The Thyssenkrup supervisory board also approved the collaboration with the Indian steel manufacturer. This deal will see both steel majors combine their European businesses to form a 50:50 joint venture. ii. The resultant entity, which will be called Thyssenkrup Tata Steel BV, will be the second-largest steelmaker in European steel sector after Lakshmi Mittal's ArcelorMittal. i.JP Nadda, Union Minister for Health and Family Welfare presented the Pradhan Mantri Surakshit Matritva Abhiyan (PMSMA) 'IPledgefor9' Achievers and MMR Reduction Awards. The ‘IPledgefor9' Achievers Awards were given to individuals and teams of doctors from the private sector and States for their remarkable services, outstanding support of institutions and commitment in achieving the mission’s objectives of safe motherhood to every woman in India. ii. According to Mr Nadda, India has shown 22% reduction in Maternal Mortality Ratio (MMR) since 2013. Uttar Pradesh has shown 30% decline and has topped the chart in the reduction of maternal deaths. i. The ISSF Junior World Cup 2 concluded in Suhl, Germany, where 761 junior shooters gathered and competed in 22 Rifle, Pistol and Shotgun events — both individual and team. They represented 61 countries, piling up the impressive total of 1544 starts: the highest number in the history of the Junior World Cup. ii. India and the People’s Republic of China battled all along the competition for the top position in the medal board, which was eventually taken by the Indian National Team with 26 total medals: 15 golds, two silvers and nine bronzes. iii. Manu Bhaker shot 242.5 points and won the gold medal in 10m air pistol event. She created a junior world record. i. Janardan Singh Gehlot was elected the president of the International Kabaddi Federation (IKF) for the next four years. ii. It was announced after the Annual General Congress (AGC) of the federation, conducted in Dubai, the UAE.